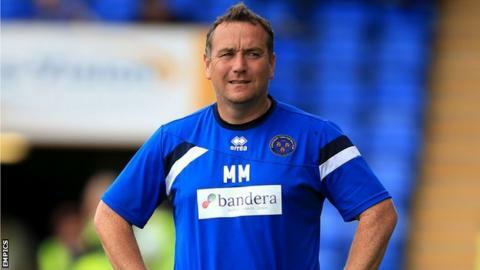 Shrewsbury Town boss Micky Mellon says it would be "clutching at straws" to take anything positive from their latest setback to life in League One. Tuesday's 2-1 home defeat by Chesterfield left them still searching for their first win after three games. "We'll comb over it but sometimes the best thing to do is move on very quickly," Mellon said. "We would be clutching at straws if any of us - me included - came out with any kind of credit." After winning promotion back to League One last season, Town have only one point - taken from Saturday's 1-1 draw at Bradford City - to show for their efforts so far. They have had success in the League Cup though, knocking Championship side Blackburn Rovers out in the first round. "It's been a tough four games," Mellon told BBC Radio Shropshire. "We've got to get dusted down, work hard and put it right. "We mustn't be too critical of ourselves because we are a group and we will stick together." Shrewsbury took four points from their opening three games as they made a steady start in 2013-14. Victory over Swindon was their only win in the first 10 games as the Shrews eventually suffered relegation.